A mysterious young man (Bryan Gosling) spends his days acting as a full time auto mechanic and a part time stunt driver. By night, he’s a wheel man for armed robbers. No matter the job, he remains the consummate professional and has resigned himself to a strict routine. Shannon (Bryan Cranston), his friend and mentor, hopes to one day put the young man’s uncanny driving abilities to more lucrative use. To accomplish this, he turns to small time mobsters Bernie (Albert Brooks) and Nino (Ron Perlman) for financial assistance. Meanwhile, Shannon’s star driver befriends Irene (Carey Mulligan), a waitress who struggles to raise her young son Benecio (Kaden Leos) alone. When Irene’s husband Standard (Oscar Issac) returns home from jail, he is immediately recruited to participate in an armed robbery. Shannon’s protégé step s in to help, only to find himself embroiled in a violent double cross. 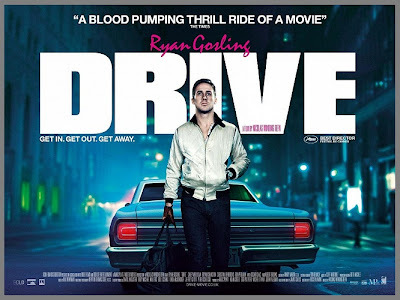 Drive is a stylish new crime film from director Nicolas Winding Refn and screenwriter Hossein Amini. It’s based on a novel of the same name by James Sallis. The film is no stranger to genre conventions, but courts them in a rather unusual way. In an age where even the simplest films hold the viewer’s hand at every step, Drive requires the audience to do its share of the leg work. It provides all the materials necessary for one to understand what is happening and why, yet still leaves room for personal interpretation. Cinematographer Newton Thomas Sigel takes a disciplined yet varied approach to the material. Drive was filmed on location in Los Angeles. Nighttime aerial shots of the city make it look as sprawling and expansive can be imagined. This is an interesting contrast to how things appear at ground level. The characters inhabit meager accommodations and toil away in garages and diners. Interestingly, the transitions between the aerial and ground level shots aren’t at all jarring. The visual integrity is maintained throughout. The seemingly glamorous veneer hides a world of small time criminals. The locales harken back to the crime films of the 1970’s. They are bathed in sepia tones. The action is much more sparring than the trailers would have one believe. Refn, along with his cinematographer Sigel and Editor Matthew Newman, create set pieces that are the antithesis of modern chaos cinema. The car chases don’t revel in excessive destruction of public property. They also aren’t cut together in a way where every shot is meant to be an orgasmic pay off unto itself. They are fairly basic in conception, lasting only as long as is necessary to get a visceral reaction from the audience. Smaller action scenes employ slow motion to an almost dreamlike effect. That, coupled with startling graphic violence, makes them both thrilling and nightmarish. The hero is the proverbial man of few words. The film doesn’t even bother providing him with name. He is totally and completely defined by actions. His deadpan expression rarely changes save for a goofy smirk that surfaces during the films lighter moments. As the situation intensifies, a different side of him begins to emerge. He is eventually revealed to be capable of shocking, sudden violence. He is also able to improvise in violent situations. As written by Hossein Amini and played by Ryan Gosling, the character is an intriguing study in repressed sociopathy. He isn’t totally incapable of love or empathy, yet reacts with biblical finality when him or his are threatened. Drive is the most effective genre exercise of its kind to come out this year. It arrives nearly ten months after the eerily similar Faster. Both films bear a striking resemblance to Walter Hill’s underrated 1978 crime film The Driver. That two recent films would so lovingly pay homage to an effective yet seemingly forgotten genre exercise shows that the lessons of the 1970’s have not been lost on all of today’s filmmakers. Style and pacing can make all the difference in the world when it comes to even the most clichéd material. Drive is a bizarre ride down a very familiar stretch of road. Once the trip has come to an end, the strange sights witnessed along the way prove unforgettable.